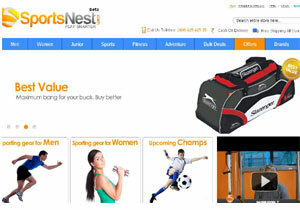 Sports Nest Retail (India) Pvt Ltd, which runs the six month old e-commerce website, SportsNest, focused on retailing sporting, fitness and adventure gear, has raised an undisclosed seed funding from early stage investor Blume Ventures. Blume Ventures, a micro-venture fund focused on investing in tech-enabled businesses, typically invests anywhere between $50,000 and $250,000 or Rs 26 lakh to Rs 1.3 crore, so the quantum of the new investment in SportsNest, which was closed a few weeks ago, would be in this range. The company, founded by first generation entrepreneur Sanjay Rao, started its operation in July this year. Although it started with B2B operation in private Beta in September, it launched the B2C site for online purchase of sporting, fitness and adventure gear only three weeks ago. Rao has more than 10 years of IT sector experience mainly with product development companies like i2, Oracle, Wipro, and Symphony. (He is also the co-founder of SportingMindz, a company focused on video analytics and predictive analysis in sports). Currently, SportsNest has over 25 product categories for men, women and children that include clothing, footwear, fitness and adventure equipment. Over 5,000 products are available online and the firm expects this to go upto 25,000 SKUs soon. Customers can get their products shipped free across India with an option of Cash-on-Delivery (COD) and the site also provides 24X7 customer care. In addition to the online store that is up and running, SportsNest plans to give its customers the ability to experience its products and buy them offline as well. According to Rao, the digital consumption story is growing very fast due to user friendly format of the online retailing model. "However, sporting, fitness and adventure segments are rather underserviced despite increasing demand. Customers do not have easy access to a wide range of latest products, accessories or brands. Therefore, by offering these on an online platform and combining it with expert advice and other value adds, we intend to create a whole new segment within the sports category," he said. "Sports goods purchases, as an experience, must be one of the worst retail experiences that I've personally had and there seems no sign of improvement. An odd organized retail brand format in a mall isn't sufficient to cater to the ever more sporty consumers. SportsNest will deliver the promise of convenience, price and variety on the site but we're more excited about how they plan to take customer engagement and satisfaction to a new level, with some nifty innovations," said Karthik Reddy, Managing Partner, Blume Ventures. Another e-com site selling sports gear in India is Decathlon Sports India, which is the Bangalore based arm of the eponymous company headquartered in France. The firm was founded in 1976 in France. Decathlon.in is a B2B site, while it also has its own offline retail store in Bangalore. Though, the website offers individual buyers link to what it calls 'premium resellers' for direct purchases. There are at least two e-com links from the company's own B2B site for such a purchase Playgroundonline and Lifemojo.